Human behaviour impacts safety at every step – from the initial design of plant and equipment, to the manufacture of equipment, the installation of this equipment, commissioning and plant operations over many years. “Even your best people make mistakes, take chances or are negligent at times”. Human factors are inseparable from safe work – the main goal of safety on a plant is essentially to protect humans from harm. 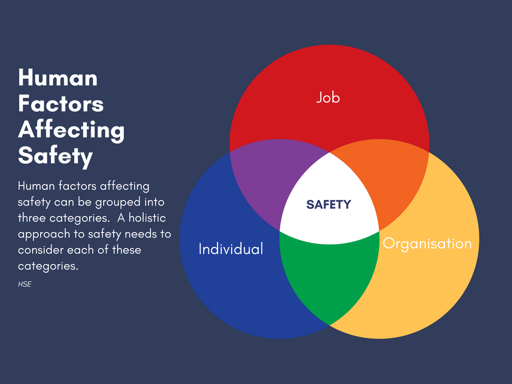 According to the HSE, these human factors can be grouped into three categories: the job, the individual and the organisation. Job factors relate to the task itself, workload, procedures, environmental conditions, location etc. Individual factors relate to competence, skills, attitudes, risk perception etc. Organisation factors relate to culture, leadership, effective communications etc. Unfortunately, an analysis will usually reveal that most incidents result from human behaviour. 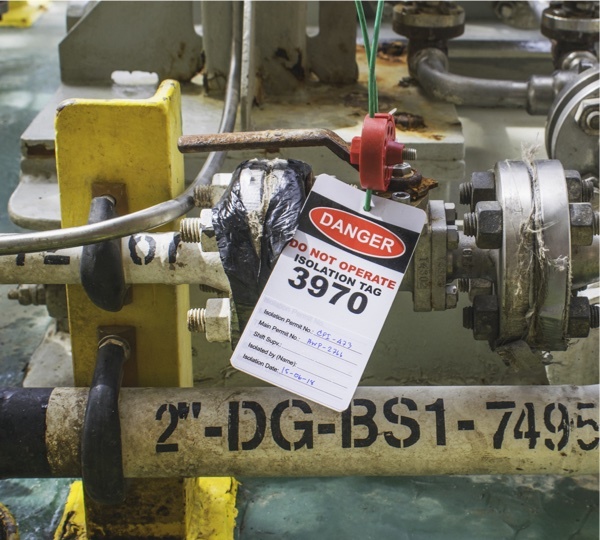 While plant and equipment can (and sometimes does) fail, more often the root cause of a safety incident can be traced back to something that someone did or omitted to do in the past. 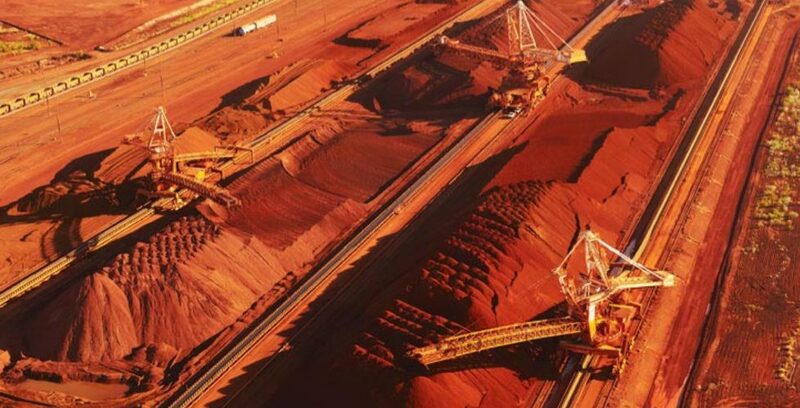 The very best plant and equipment design, the most rigorous procedures and a supporting organisational culture cannot fully eliminate the risk of human errors or deliberate violations of procedures. Training is seen as the most important intervention that will ensure that workers are competent in their jobs. Training is always a good thing, when done right. It is even better when safety training is laser focused on the precise requirements of the job. Good training does however need to be properly planned and well-structured to be effective. Safety training needs to be sponsored at the highest level in the organisation to reinforce its importance. If safety training is weak, it can in itself become a root cause of incidents by leading to a false sense of complacency and poor decisions. In this article we take a look at safety training and how individual competencies can be linked to the permit to work system to improve overall safety discipline and safety culture. When it comes to operations safety, the permit to work is the crucial link between all the activities necessary to do safe work on the plant. The permit ensures that the work is properly planned, the preparations are in place, all hazards are identified, the job risk assessments are properly done, people are informed, isolations are in place and so on. The permit is also the most appropriate checkpoint for ensuring that each person working on a job is trained and competent to do so. A computer-based permit system is in theory easily able to cross-check against training database and other relevant information to ensure that the necessary competencies are in place to do the work. But there are a few important considerations to consider when designing such a system. One goal of safety training is to make sure that all personnel involved in the job are competent to carry out their responsibilities when working on the plant. Safety training needs to be very closely aligned to the actual tasks to be effective. It is not always adequate to use general qualifications as evidence of the very specific competencies needed for working safely on a specific task. Getting the level of detail right requires some upfront planning. Operators and Technicians need to understand and conform to procedures for safe work, obtain authorisation for any variations from the normal procedures, communicate and co-operate with others involved in the job. Supervisors and others in a supervisory role need to ensure there is compliance with procedures, authorize variations, ensure the procedures used are appropriate, accurate and current, ensure people are competent to do the work required, monitor the work and ensure that corrective actions are taken. Managers are responsible for implementing the organisational structures necessary for safe work, providing the policies, appointing competent people, ensuring there is supervision in place, monitoring, auditing and reviewing as required and taking corrective actions. An effective safety training programme will recognise these roles and the level of experience and responsibility that goes with each. It is not a case of one size fits all. Requestor – the individual who initiates the work by requesting a permit. Issuer – the person who formally issues the permit to the individual or working party doing the work. Acceptor – the person who accepts the permit on behalf of the working party. Member of working party – a person who is part of a work team working under direct supervision (for example a contractor) who participates in job risk assessment, and does the work. Tester – the person responsible for testing conditions such as pressure, temperature, presence of toxic gases etc. Isolator – the person(s) responsible for ensuring the area to be worked on is properly isolated from energy sources or other hazards. Witness – the person witnessing a test, task or action to verify it is correctly completed. Spotter – the person observing a dangerous task in order to mobilise emergency assistance should it be required. These roles will of course be plant specific and defined in terms of the company’s permit to work and isolation procedures. Defining the specific competencies needed for safe work will then need to take into account the roles above, together with additional skills that are relevant to that role. For example, the “Tester role” needs to be skilled in the use of Drager instruments for detecting toxic gases or explosive mixtures. This information forms the basis of building a training programme. The training content should be chosen to improve understanding, teach a specific skill or achieve a specific outcome. As mentioned, a well-designed safety training programme must always ensure that individuals are competent for their expected role on the plant. The training programme itself may be a combination of classroom training, self-study, site familiarisation and on the job training. It may be short term (e.g. contractors on short term assignments) or long term (e.g. permanent employees at the plant). An effective training programme must also take into consideration prior training and experience. Competency should be assessed formally during and at the end of the training programme and then re-assessed regularly. Competency always needs to be assessed against a defined standard. Standards may be company specific or industry specific. Assessments may include written tests, observations in the workplace, experience logbooks and so on. Competencies should be formally assessed and confirmed by people who are familiar with the practical requirements of the job ensuring that training stays relevant and addresses the real requirements. Refresher training, or ad-hoc training on topics that for example relate to changes in the process, or changes to specific procedures etc. will normally be required on an ongoing basis. Formal training records are essential to ensure individual needs are identified. Compliance with legislation and company policy will also require these records to be maintained. All of the above information is normally maintained in a training database. Having computerised competency data at the right level of detail will enable linking to the computer-based permit to work system. This allows competencies to be checked in real time as each permit is prepared, issued and subsequently managed through the job. But there is a trade-off required here. Having competency data at too granular a level might unnecessarily complicate the administration and maintenance of the skills database. Out of date or inaccurate records owing to an overly complex system can become a new, unintended risk. Having the competency data at too high a level (too aggregated) will reduce the ability of the system to adequately check a person’s suitability for the proposed job. Again, a balance is required between the ease of use, the ease of administration and the usefulness of the system. In most cases the tradeoff between too much data and too little data follows the Pareto principle – that is to say most of the benefit will be obtained with relatively little effort, after which there will be diminishing returns for additional effort (data) in the system. Getting this balance right takes some experience. 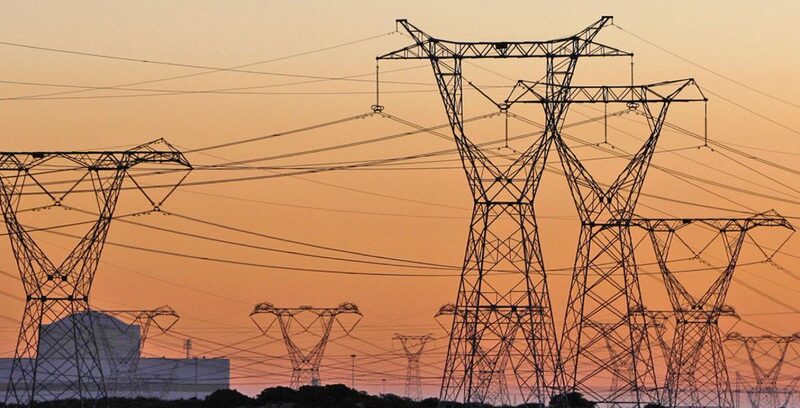 During past IntelliPERMIT projects we have developed a detailed methodology for the best way to approach this problem. Linking competency records from the training system to the permit system will have the benefit of raising the bar on the way safety training is managed. Safety training is no longer a nice to have or something to be done when you have spare time. Nothing focuses the mind more than whether a person will or will not be allowed a permit to work. A successful project will result in good alignment between the training department and operations/maintenance. Human factors relating to the job, the individual and the organisation have a major effect on safe work. Each of these needs to be understood and managed in a balanced and holistic manner. People working on a plant have to be competent for their role and the requirements of the task they are performing. Defining the necessary skills and competencies for safe work needs an analysis of the relevant roles as well as details of the work required. When these competencies are properly aligned to the requirement of the job it then becomes possible to structure an effective training programme that will support safe work on the plant. 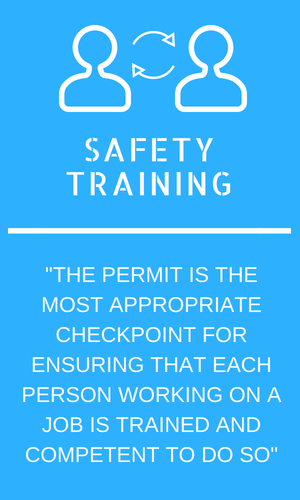 When the safety training records are linked to the electronic permit to work system many benefits are possible. People doing the work must be certified as competent in the task required or else they will not be issued with a permit. There will as a result be improved discipline and conformance to procedures. There will be improved alignment between the training department and the needs of the operation. This improved alignment will also address several of the other human factors and improve overall safety. The IntelliPERMIT system has several built-in features that are designed to ensure people are competent for the task before the work can start. IntelliPERMIT also includes integrations to several external training systems. IntelliPERMIT can augment the information in these external systems with specific information needed in the permit to work process. 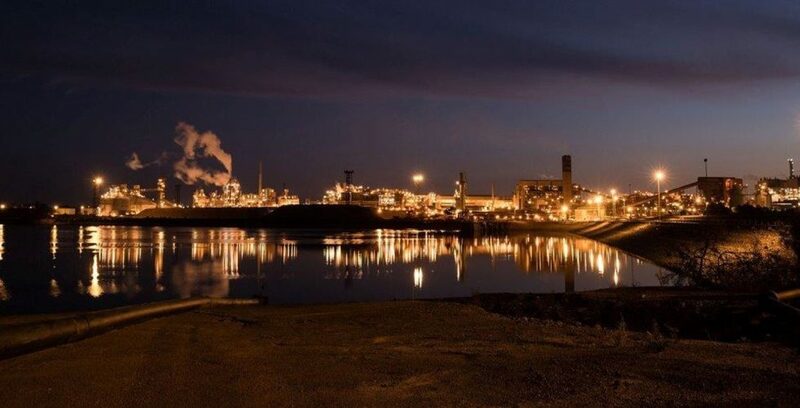 These features have been successfully implemented at a number of customers who are reaping the benefits daily through improved safety and more focused training. For more information on best practices in this regard and other ways to improve safety in your business, please feel free to contact the IntelliPERMIT team at Adapt IT. If you have any questions or suggestions to improve this article, please contact the IntelliPERMIT team at Adapt IT.